Hi, I’m Theresa Nie. A native of PA, I was a state qualifying swimmer in high school, a marathon runner in college, and fell in love with cycling when I biked 3,600 miles across the U.S. before my senior year of college for a charity event. I’ve been competing in triathlons for the past ten years. It’s a healthy outlet for me, especially as someone who wrestles with anxiety, depression, and autoimmune illness. I’m passionate about sharing my journey and encouraging others who have chronic health issues. I’m also an avid writer and love blogging as well as my job at Prison Fellowship. My favorite race distance is Olympic, but my husband is more of a Half or full distance triathlete. He sometimes pushes me out of my comfort zone! Last fall we both raced Waterman’s Half and loved it! You’ll find us at several Kinetic Multisports races this season. 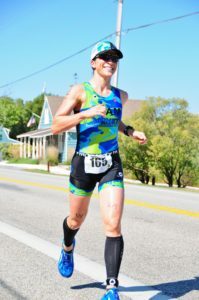 I look forward to helping answer any questions you may have about our races, gear, or training! Have a great season and welcome to the Kinetic Multisports community!